Downscaling high fashion or upscaling regular wear? 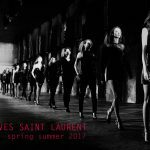 I will be drawing a general conclusion as to what we’re expecting from the Spring Summer 2014 season in terms of main trends and style directions. However, until then, I am, malgre moi, in a witch hunt on the New York Fashion Week’s catwalks. What I am chasing after? Sandals. Why? Because I’m simply trying to determine who’s who and who’s replica is better when it comes to the new utilitarian sandals walking up and down the catwalks of the next season. Models should be happy as these sandals do offer comfort before anything. But are we? How will we know which are the utilitarian sandals we knew and loved and which are the haute fashion utilitarian sandals? I signaled the appearance of such footwear in the Trina Turk Spring 2014 collection presentation. 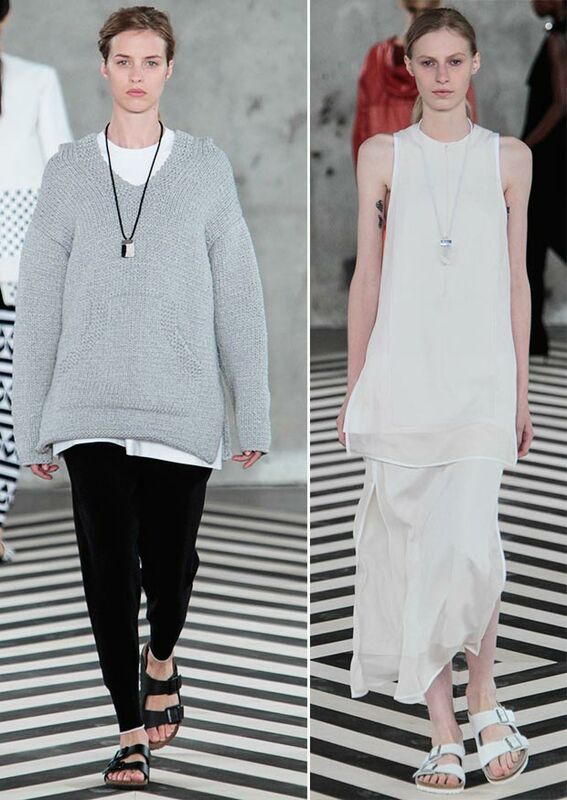 Here I am again, on a case study talking about the Edun Spring 2014 runway. As I was given to understand from official sources at Trina Turk, the difference between the good ol’ Birkenstock Arizona sandals and the Trina Turk Vagabond sandals resides in the quality of the leather they used for the latter and also in the adornments. Regular Birkenstock sandals don’t usually carry the type of golden locks and rings, studded uppers or anything in this repertoire. 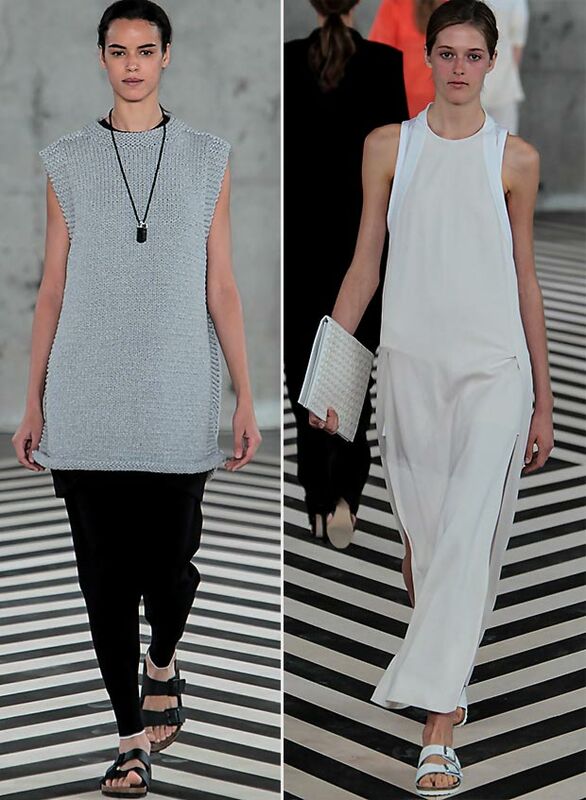 Now fast forwarding to the present situation: Edun Spring Summer 2014. The fashion company started by Ali Hewson and husband Bono (yes, U2’s Bono) in an effort to sustain ethical fashion with a conscience received unparalleled support from LVMH. (remember Bono and Ali even made it into one of Louis Vuitton’s Core Values campaigns?) As such, their fashion adventure became larger than life and showing at the NYFW was de rigueur. As an avantgout of what we’ll be talking about when drawing the conclusions: Spring 2014 is very graphic. 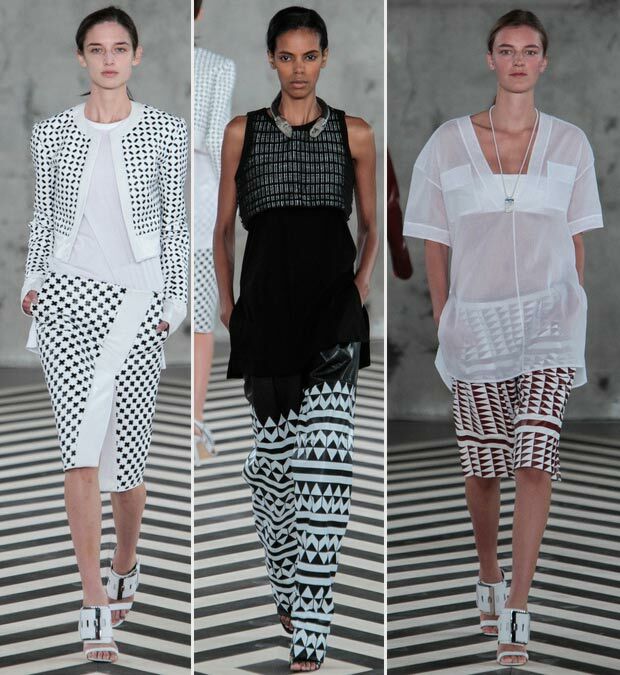 Edun’s collection is a full display of black and white geometrically patterned wardrobe, scheming around the comfort wearing coordinates. Flat footwear and bulky moderately high heels alike were proposed on the runway but I will only concentrate on the flat section. And more specifically on what was unanimously named by the press as ‘utilitarian sandals’. No detailed images have surfaced so far, although I traveled high and low on the fashionable paths of the interwebs, from Edun’s official site to the Daily Beast’s fashion reports. So it’s in our hands, then. Or more specifically in our eyes: do you trust your instincts to swear by Birkenstock? Or do you think Edun has found a way to twist around the legendary German footwear and make an utilitarian sandal of their own, with the exact same look and purpose? Mind you, we’re not talking about the different color of a shoe’s sole like Louboutin and Saint Laurent keep disputing the supremacy of the colored soled shoes! This is a lookalike as real as it gets. If I was crying wolf, then cast the stone over in Fashionista’s court as well for they have signaled the comfy Birkenstocks in two more fashion shows (namely Shades of Grey and Houghton – had they been referenced by styledotcom, I would’ve noticed their Birk-alike sandals as well. Alas they haven’t, so I’m thankful to Fawnia Soo Hoo for having highlighted the said collections). Trusting you with my rant, I will presently and voluntarily put an end to the Birkenstock witch hunt. Yesterday, when I scooped the Edun presentation photos, nobody had said a word about the Birkenstocks. Today, I find the mild comfort of sisters-in-fashion-arms from Fashionista who joined me into signaling the fashion’s comfort direction. Yes, it’s happening. 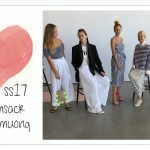 Birkenstock finally became a catwalk item.